As is usual in my family, we don't get the chance to get everyone together for Christmas on Christmas Day.﻿ It is usually the day before, or the day after. This year it is not until December 29th! That left the door open to do some hiking on the 25th through the 27th for me. I had hoped to climb some high peaks, or do some backcountry skiing, but the trail conditions weren't good for either. I didn't want to bring my dog Rev up any steep trails in the crazy ice conditions that have been reported. 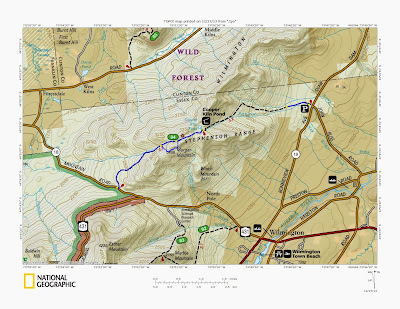 So with that in mind, I looked on the maps for trails that I hadn't done yet that would provide a nice safe outdoor adventure for us. On Christmas Day I choose to hike the Cooper Kiln trail to Cooper Kiln Pond. I also wanted to take a short bushwhack to Morgan Mountain and possibly Wilmington Mountain, both on the ADK hundred highest list. 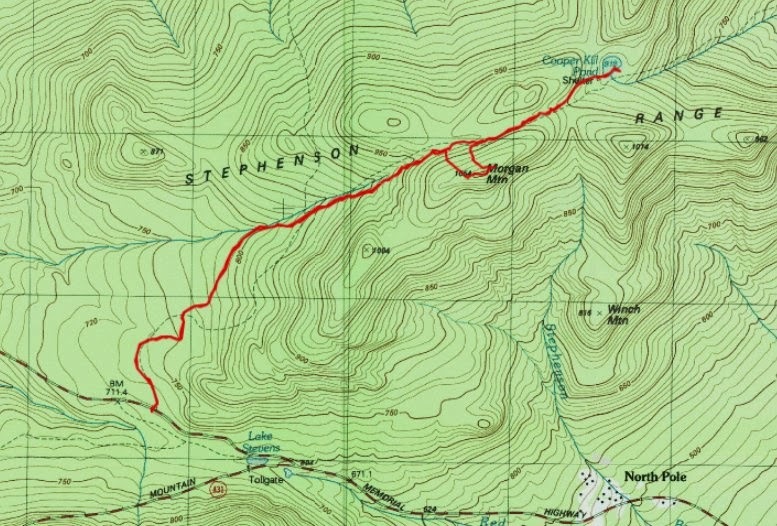 I decided that Leesa and I would start the hike from the trailhead on Bonnie View Road to the east. This route would be slightly longer (3 miles vs. 2.6 miles) one way to the pond. 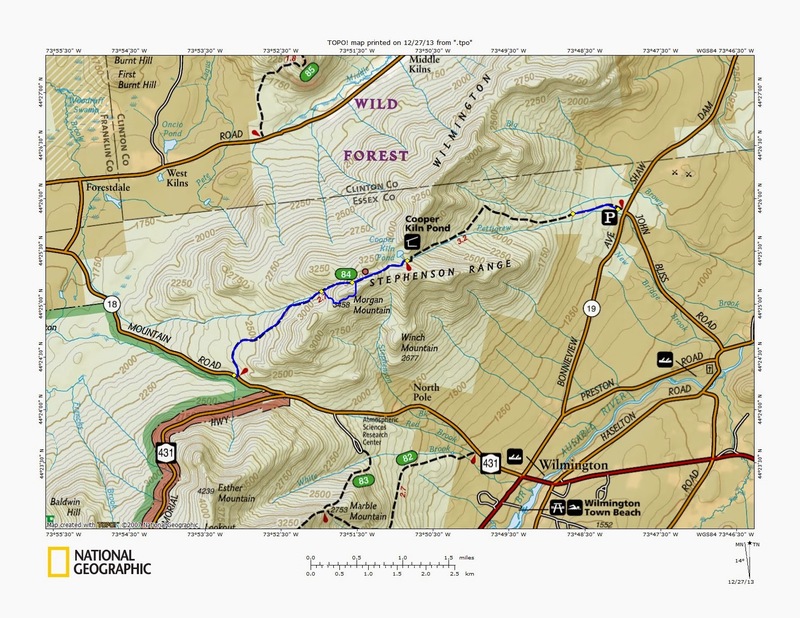 It would also be a bit steeper since the trailhead is over 1000 feet lower than the trailhead to the west on the Wilmington Highway. That was OK since we wanted the exercise. Things didn't go quite as planned. We parked on John Buss Road, near the intersection with Bonnie View Road, and started out. We had traveled just over a half a mile when we came to a stream crossing. I was able to cross on a nearby log, but our dog Rev wanted no part of it. Leesa and I decided that we would go back to the car and try the trailhead from the west approach on the Wilmington Highway. As we drove around the north country on this Christmas Day, we noticed that there were many little pocket areas that had ice storms. It was funny, one neighborhood could look like an ice storm hit, while the next neighborhood could look totally different. Some areas had lots of ice, other areas had little to none. That trail proved to be OK and we made our way towards Cooper Kiln Pond. The trailhead is at 2360' (much higher than the 1330' and the eastern end). The grade is really easy for the first mile, gaining only 250'. At this point the grade got moderately steep and we climbed 600' in the next .9 miles before reaching the height of land where it was time for us to bear right and begin our .2 mile bushwhack to Morgan Mountain. On the entire length of this trip, the snow depth was only 1-2" deep. There was lots of ice under the snow, however, so we wore Microspikes the entire day. As expected, the bushwhack was quite easy. The woods were relatively open and it was easy to make our way to the tops in a matter of minutes. The summit offered no real views, but we poked around and found some small openings facing south. 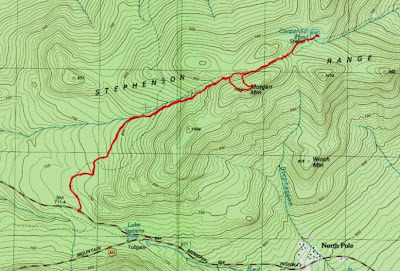 After a little exploration, we headed north to get back on the trail and go to the Cooper Kiln Lean-to and pond. Once back on the trail we followed the slight down hill grade a short distance and before we knew it we reached the lean-to and pond. Frozen ponds in winter just look fields with no trees, but we envisioned what the pond what look like in summer. As usual, we stopped at the lean-to and had some food. We didn't stay long since it was pretty cold. At this point it was about 2 PM. We talked about whether to bushwhack towards Wilmington Peak, or head back and save Wilmington for another day. Going back to the car was an easy downhill walk that took about an hour. We swung by Lake Placid on the way out. The hike to this pond, even with a bushwhack or two thrown in, is an easy half day adventure. With 2 cars, you can hike the trail end-to-end for a total trail distance of 5.9 miles.